OpenCV is a pretty versatile C++ computer vision library. Because I use it every day it has also become my go-to tool for creating simple animations at pixel level, for fun, and saving them as video files. This is not one of its core functions but happens to be possible using its GUI drawing tools. Below we'll take a look at some video art I wrote for a music project. It goes a bit further than just line drawings but the rest is pretty much just flavouring. As you'll see, creating images in OpenCV has a lot in common with how you would work with layers and filters in an image editor like GIMP or Photoshop. I also like to set compiler flags to enforce the C++11 standard, but this is not necessary. Now you can build the project by just typing cmake . && make in the terminal. This will also initialize everything to zero, i.e. black. Now we can draw our graphics! I had an initial idea of an endless cascade of concentric rings each rotating at a different speed. There might be color and brightness variations as well but otherwise it would stay static the whole time. 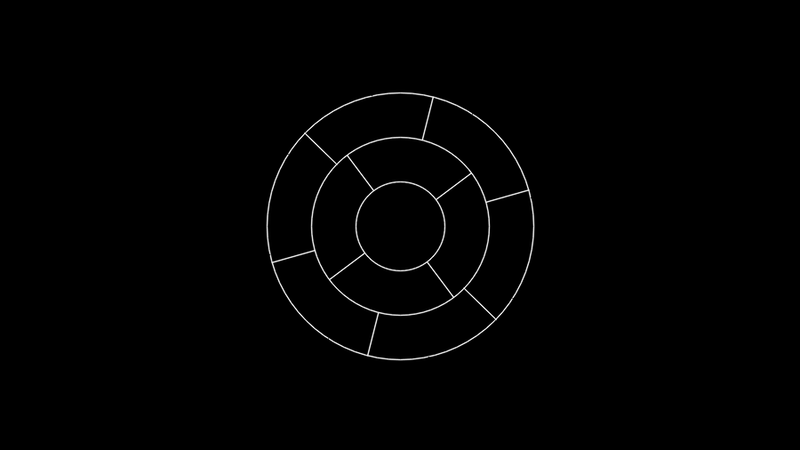 You can't see a circle's rotation around its center, so we'll add some features to them as well, maybe some kind of bars or spokes. 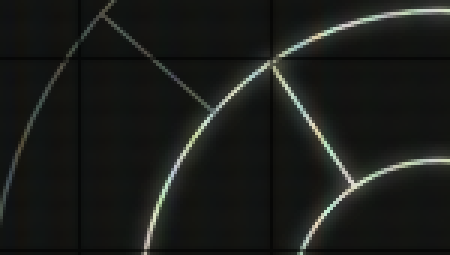 Drawing antialiased graphics at subpixel coordinates can make for some confusing OpenCV code. Here, all coordinates are multiplied by the magic number 8 and the drawing functions are instructed to do a bit shift of 3 bits (2^3 == 8). These three bits are used for the decimal part of the subpixel position. The coordinated of the bars are generated for each frame based on the ring's current rotation angle. Here are some rings at different phases of rotation. A bug leaves the innermost circle with no spokes, but it kind of looks better that way. I wanted a subtle vector display look to the graphics, even though I wasn't aiming for any sort of realism with it. So the brightest parts of the image would have to glow a little, or spread out in space. This can be done using Gaussian blur. Gaussian blur requires convolution, which is very CPU-intensive. I think most of the rendering time was spent calculating blur convolution. It could be sped up using threads (cv::parallel_for_) or the GPU (cv::cuda routines) but there was no real-time requirement in this hobby project. There are a couple of ways to only apply the blur to the brightest pixels. We could blur a copy of the image masked with its thresholded version, for example. But I like to use look-up tables (LUT). This is similar to the curves tool in Photoshop. A look-up table is just a 256-by-1 RGB matrix that maps an 8-bit index to a colour. In this look-up table I just have a linear ramp where everything under 127 maps to black. 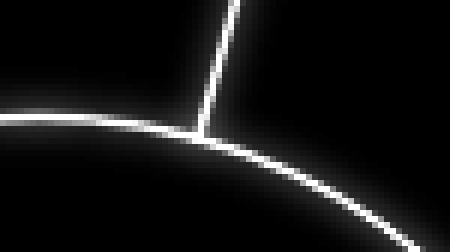 The effect works unevenly on antialiased lines which adds a nice pearl-stringy look. I created a vignetted and dirty green-yellow tinted look by multiplying the image per-pixel by an overlay made in GIMP. This has the same effect as having a "Multiply" layer mode in an image editor. Perhaps I was thinking of an old glass display, or Vectrex overlays. The overlay also has black grid lines that will appear black in the result. Multiplication doesn't change the color of black areas in the original, but I also added a copy of the overlay at 10% brightness to make it dimly visible in the background. Some objects flicker slightly for an artistic effect. This can be headache-inducing if overdone, so I tried to use it in moderation. The rings have a per-frame probability for a decrease in brightness, which I think looks good at 60 fps. The spokes will also sometimes blink upon encountering each other, and the whole ring flickers a bit when it first becomes visible. const std::string text("finally, the end of the "
I then ran this program from a shell script that piped the output to ffmpeg for encoding. This way I could also combine it with the soundtrack in a single run. The 1080p/60 version can be viewed by clicking on the gear wheel menu. Love the aesthetic, never thought about using OpenCV before for drawing! If I had time (to find someone to do it), I would like to see an animation of floating lines, infinite in length so in a video one would see only a section of them. The lines would be flowing slowly but uncontrollably in (3D) space, but as they would have "no" thickness they wouldn't necessarily need that kind of dimming effect. The lines would be of three colours - white, red and black so the background should most probably be some kind of blue to be able to see the lines. The lines would be "flowing" from one end in the infinity towards the other end. If the lines should meet, intersect in the space, they would get stuck, maybe the intersection point would move along the lines to allow continuation of the floating of the lines. When a white line would meet a red line, the red line would take over, i.e. the flow of the white line would be red starting from the intersection point. Same way the black line would take over the red line and the white line would take over the black.